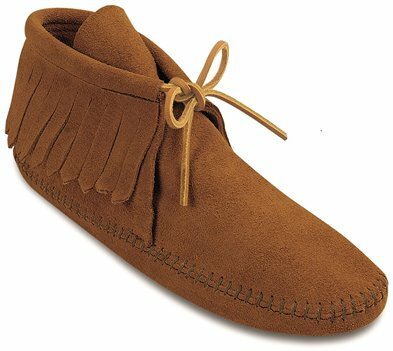 Our most iconic and traditional moccasin silhouette, fans have been making this classic style all their own decade after decade. Been wanting a true moccasin for myself. I buy so many for my daughters and they're so cute. I was hesitant about ordering these since there's no sole but after reading reviews from other websites I felt confident that they wouldn't be destroyed within the first week. Glad I did, they're great! I wear them without socks on pretty much all floor types outside. My feet get a bit cold if it's cold outside but other than that they're great. I love how versatile they are, they really do look great with everything. I've worn them several times, and travelled with them as well. They're very light weight and pack well. I'm excited to wear them more this spring and summer. I enjoyed shopping on shoeline. I was looking for these shoes from several websites and these came up with a coupon so it was the best deal. It was my first purchase with them so I researched to make sure they were a legit company. Shipping was fast. I absolutely love my moccasins I wear them with everything and they are always in style.